First Pride Meeting of the Semester! Join us tomorrow at 7:00 PM in the Monongahela room inside the HUB for our first meeting. There will be food, games, and more! Cannot wait to see you there! Tonight’s meeting is the last meeting of the semester, so we’re ending it the same place we began it. Instead of G43, please meet at 7pm in the LGBT Resource Room, Delaney Hall 327. Lavender Graduation is a small ceremony to congratulate the LGBTQIA community’s graduating seniors for their hard work, and to present them with lavender cords which they may wear at graduation. This year, Lav Grad will be held this Friday, April 29 from 4 – 5:30pm in Breezedale (on the north side of campus, behind Northern Hall). If you are a senior in the community and are graduating in May or December, you’re eligible to participate. Please email Alyssa Dachowicz at RPJT by Wednesday at the latest if you are interested. You do not have to be present for the ceremony to participate and receive your cords. If you cannot attend but would like to be recognized, please email Alyssa. Congratulations to the new officers! The current officers will be in touch, as we’d like to get everyone together to talk about the next year for Pride Alliance. At tonight’s meeting, we will be holding officer elections for the 2016-2017 school year. We would like to have you all attend to cast your vote for next year’s officers. If you are not present, you cannot vote. If you are running in the election, please prepare a paragraph about why you feel you are a good fit for the organization and the position(s) you are running for. All candidates will have the opportunity to present their paragraph to the members at the meeting. If you are unable to attend the meeting and still wish to run for a position, please email the Pride Alliance account with your paragraph, and it will be read for you. Thank you, and good luck to all candidates! Today from 12 noon to 4:30 pm in Delaney Hall G5, Pride will be hosting IUP Speaks Only Love. Only Love is a photo event, where you will have the opportunity to show your support of the LGBTQIA+ Students on campus by getting your face painted, making or holding a sign, and having your photo taken. Due to inclement weather on Monday, the decision was made to postpone IUP’s Day of Silence to this Thursday, April 14th. A "Breaking the Silence" event will occur after the 2016-17 Officer elections at the Pride Alliance meeting that evening. Information such as speaking cards and stickers for Day of Silence will be available at IUP’s Only Love event, happening on Wednesday from noon-4:30 in Delaney G5. As a reminder, please email your professors if you wish to participate in Day of Silence. Many professors award points for class participation and discussion and it would be unfortunate if you were to lose points for your participation in Day of Silence. Additionally, participation in Day of Silence does not exempt you from mandatory activities such as presentations. Do not show up to a class you are meant to present in and expect your professor to allow you to postpone your presentation. Sorry for the late notice, and I hope everyone has a great week. Our annual dance party welcomes back D. J. Adele from the “burg” this Saturday night April 2nd. Retro to current tunes ! A Mardi Gras theme if u care to come in costume or mask but certainly not necessary. 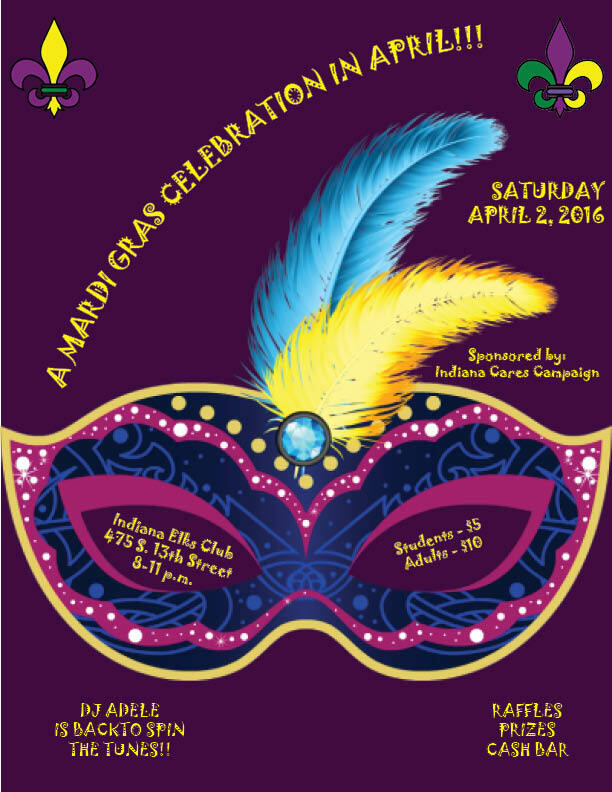 Raffles, cash bar at reduced club prices and prizes 10.00 adults & 5.00 for students. ALL are welcome. Indiana Elks Club-475 South 13th Street, Indiana, Pa 15701. Upper level, private bar and dance / social area. Plenty of free parking in the club lot or across the street @ Cambria Rowe if necessary. Doors open @7:30…..D.J. Begins @8:00. I am so sorry that this reminder is so late in getting out to you all! My life has been a little hectic, please forgive me. Elections for next year are coming up soon! Initially, we wanted to have interested people email us by today. Since it’s late getting out to you, if you would like to be on the ballot for elections for next year, please send an email to prideallianceiup (or reply to this one) with your name and the position you would like to run for before Monday morning. We’ll have more information about elections for you at tonight’s meeting. We will be in G43 at 7pm as usual. Please join us for an evening of fun with DJ Adele from Pittsburgh. Please share with everyone you know!